SYNOPSIS: It’s been two years since Conrad told Belly to go with Jeremiah. She and Jeremiah have been inseparable ever since, even attending the same college—only, their relationship hasn’t exactly been the happily ever after Belly had hoped it would be. And when Jeremiah makes the worst mistake a boy can make, Belly is forced to question what she thought was true love. Does she really have a future with Jeremiah? Has she ever gotten over Conrad? It’s time for Belly to decide, once and for all, who has her heart forever. We'll Always Have Summer is the third book in the The Summer I Turned Pretty Trilogy. I already wrote a review of The Summer I Turned Pretty and It's Not Summer Without You so feel free to read those too. Ever since I was left hanging and wanting more when I read The Summer I Turned Pretty, I've always expected the story to get better with each book. It did pick up during the 2nd book, so I was mildly expecting the 3rd book to be somewhat epic. It wasn't. For me, at least. A book, for it to be epic to me, has to give me a hangover. We'll Always Have Summer didn't. But I'm not saying it was horrible. It had some redeeming qualities but in the end, I wasn't raving about it like most readers on Goodreads. So how will I go about this review? I'll make it easy for everyone who's patient enough to read this till the end. It's pretty basic, actually. 1) What was good about it, and 2) Why it didn't give me a hangover. It was logical. Belly had to choose between Jeremiah and Conrad, naturally she had to make the more logical decision. Alright it wasn't so much of being logical; it was more like the typical follow-your-heart-scheme that played out. Still, it was logical. Why exactly was it being "logical" a plus for me? Simple. I didn't want to finish a trilogy only to feel frustrated at how incredibly stupid the protagonist was. However, this logical decision also has a downside to it. More on that later. Another good thing about it is the ending. In my review of It's Not Summer Without You, I mentioned that at the end of the book, a cliffhanger set "two years later" can be found. 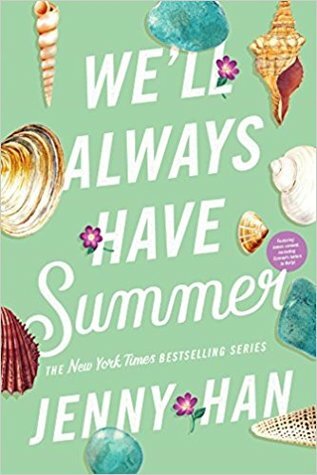 Naturally, Jenny Han would connect that cliffhanger to the last book. She didn't dwell too much on it but it was enough for the cliffhanger to make sense. Although you could easily predict (if you think of it logically) the who's and what's involved in the follow through ("two years later"), it was still nice that she wrote the story this way because it doesn't appear as if Belly's story ending was rushed. To me, if a book/series gives me a hangover when I'm done with it, it only means one thing - it's a great book and I would rave about it for days. Obsess about it, even. When I find myself wishing the male lead is an actual person and that he'd fall in love with me, I'm hungover. When I feel the need to discuss the book with someone because writing a review about it isn't enough, I'm hungover. When I feel the need to read (quality) fanfictions because I need to know what else could've happened to them, I'm hungover. I did not get a hangover. Don't get me wrong. I still enjoyed it to a certain degree. The downside I mentioned earlier: Even though I said Belly made the logical choice, getting to that decision was still a whirlwind. And often times I hated feeling like I was being forced into liking Conrad. I hated knowing that Belly would end up with Conrad in the end. He was such a Debbie Downer throughout the series! So I figured, the only way I can make peace with how the story would go is if I can see that Jeremiah would not be the better choice - and it felt forced. It felt forced the way Jeremiah suddenly had a character shift (e.g. feeling disinterested with wedding preparations - oops! Spoiler there). It felt forced when, all of a sudden, Conrad is this charming man and you finally see what Belly sees in him. All of it. Forced. It's good that she picked the better man, but really? I was forced into liking Conrad because of the sudden character shifts. Nonetheless, I appreciate how the story turned out. If only the game-changing moments didn't feel so forced, I think I (and other readers) would've overlooked those. Same turn of events, written differently. I think. I hope that made some sense. The 3rd book was quite okay, the problem was the whole series. I didn't feel attached to Belly early on so I also didn't feel attached to the story. I didn't feel like rooting for Conrad even though it's quite obvious that he's The One. I think primarily, the book lacked character development. I've said this a lot in my reviews, because it's true. For me, at least. It's been a couple of weeks since I finished the series and the most I can remember about it was Belly feeling obsessed over Conrad - and that annoyed the heck out of me. I felt like Belly was this shallow 15 year old for the most part. In addition to that, Conrad only became the lovable male lead during the 3rd book. A little too late for me. Now this is just me reviewing the entirety of the series. After all, appreciating the ending means appreciating the whole story that developed during the series. We'll Always Have Summer is better than the previous books. It's good. But the "hangover" factor is something else. Jenny Han (Han like Han Solo, not Han like hand) was born and raised in Richmond, Virginia. She went to college at the University of North Carolina at Chapel Hill (Go Heels!) and she went on to graduate school at the New School in New York City, where she received her MFA in Writing for Children. She lives in Brooklyn.